Title : Detective Conan 18 Piano Sheet Music Collection Book Language : Japanese. This is an official book. Release Date : 1999 Total Pages : 87 pages Condition : USED, Very Good, No missing page. 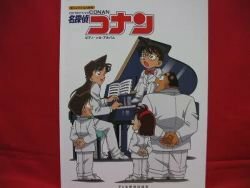 Shipping Method & Cost Payment Methods Description:This is a Japanese Anime (Manga) "Detective Conan" Sheet Music Book.